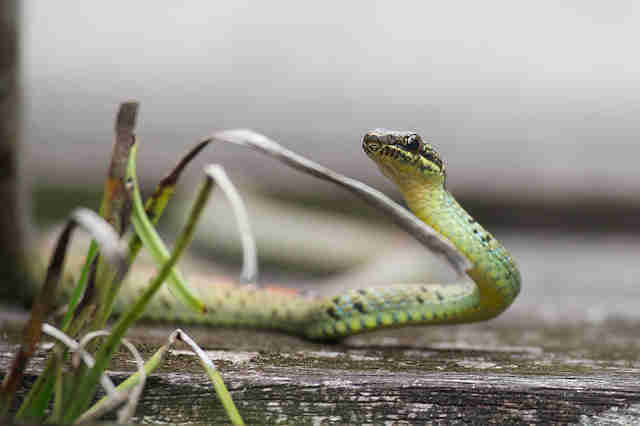 The paradise tree snake (Chrysopelea paradisi) is found in South East Asia and is one of just five snakes that are able to "fly". It regularly glides for over 30m in the air, with some individuals recorded as being airborne for 100 meters. 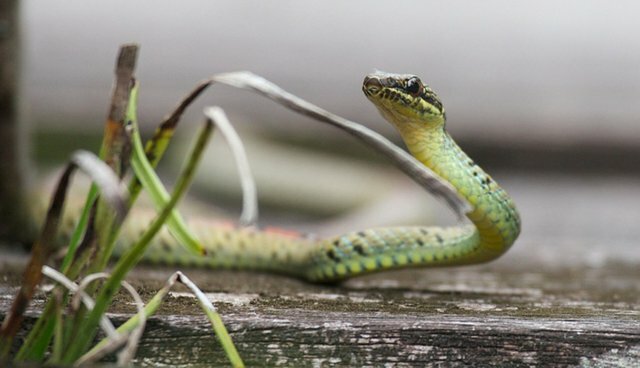 While it is not completely clear why the snakes do this (speculations range from predator avoidance to hunting) recent studies have made great strides in understanding how. You would not initially believe that the tube-like body of a snake would be capable of gliding. However, Professor Socha from Virginia Tech in Blacksburg notes that "as it jumps, it flattens out from just behind the head to where the tail starts. What it is doing is taking its ribs and rotating them forwards toward the head and upwards towards the spine." This radically changes its body shape, doubling its width and produces a unique concave structure, which the snake shapes into an S, giving it tremendous lift. "It looks like someone's version of a UFO," he said. Socha and his colleagues took these observations further by producing a 3D printed rod that replicated the paradise tree snake during "flight" and placing it in a tank filled with flowing water. "The water flowed over it [the rod] and we measured the forces on the model and we visualized the flow movement in the water using lasers and high speed cameras" said Socha. They showed that the snake would produce near maximum lift with this shape and that it would even outperform current aerofoil designs of its size. However, Socha warned that scaling the design up to the size of an airplane "would be a terrible idea" as it would no longer provide good lift. While the 3D printed model showed excellent aerodynamic properties, Socha and colleagues feel the real life version is even better still and that there is more to the snake's glide than just its concave S shape. One possibility is that it also uses undulating body movements to give it lift. "It is moving its head from side to side, it is passing waves down the body and it looks like the animal is swimming in the air" said Socha. It is hoped that this research may inspire the development of better robotics.